I'm sure by now you've heard that Bruce Irons wasn't invited to the Pipe Masters. Everyone got up in arms, setting twitter afire with scathing prose and empty promises. But, wait. Bruce is back? That's right. After Marlon Lipke pulled out due to injury, Bruce slid in to replace him. This all sounded a little suspicious to us. 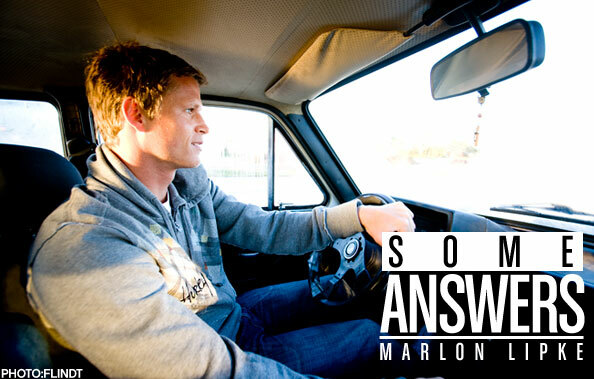 How did Marlon get hurt? Was there some Hawaiian pressure for him to back out? We called him to get the dirty dirty details. So, tell the truth, someone peer pressured you into faking an injury so Bruce could surf in the Pipe Masters? No, haha, nothing like that. The ASP called me today asking if I was going to do the contest or not, and I said that I don't know if I can surf yet, but I would like to wait till the event starts, and see if I feel any better by then. Especially since I'm training hard in the gym every day hoping to get better. They told me that I had to let them know today, so I said no because I tried to surf the other day and I was not getting very far. I would love to have entered Pipe, and I feel very bad that I had to say no today. I injured my MCL ligament in my second heat at the Rip Curl Pro Search, doing a turn on my first wave. I still tried to surf but had to give up half way trough the heat. I don't need an operation, but a lot of physio. I was in Los Angeles prior to Hawaii for 3 weeks doing physio with Dr G, which was very good, and I felt the improvement fast. I just didn't have enough time before the event here. Are you in Hawaii right now? Yeah, I'm in Hawaii now, and I was hoping to be able to surf before my heat. Maybe it is a bit too much to ask for from my body, but I was just hoping for it as Pipe is such an amazing event and you can get the waves of your life, but I guess I won't know now if I could have surfed my heat or not. So Bruce is in to replace you, has he called to say 'thanks' yet? I didn't even know about the Bruce thing, but no he has not called me. Of course I'm very happy for Bruce and he is a very important surfer to have in this event. I would be upset to see the Pipe Masters without Bruce. Check out Marlon Lipke and the rest of the European Vans surf team during their 2009 Portugal trip. Why would anyone spend the holidays working? How do you lose a contest and keep smiling? Is this pro surfer’s art actually…good? Modern Collective gave us a November 16th US release date — so where the hell is it? What are the Malloys doing back east with 500 pounds of rubber? Who wouldn’t want to sponsor that? Did Indonesia’s best surfer just lose to the contest announcer? So you won the WQS? Here’s your new bedroom. Why is half of Jersey still asleep at 1:30 pm? Why Isn’t That Guy Covered in Victory Champagne at 7 AM Not Sponsored? How Does the World #4 Pay His Bills?